Andrew Britton developed myocarditis while on honeymoon with wife Lauren in the Maldives. 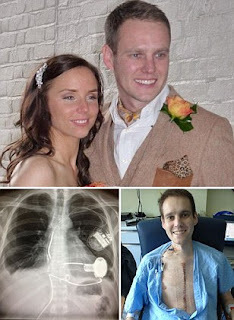 His heart rate rose to 200 beats a minute so doctors sedated him and gave him defibrillation shocks to force his heart back to a normal rhythm. His other organs started to fail and doctors had to drain 11 litres of fluid from his body when his kidneys stopped working. Eventually he became stable enough to fly home and he was taken to Harefield Hospital in London to have a defibrillator device fitted in his chest.